Manuka honey has been used as a reliable healing ointment by the native people of New Zealand for centuries. It has an amazing ability to help drain a wound, decrease pain, speed healing, minimize scarring and protect against infection. Modern science has added Aloe Vera and D-panthenol (a form of vitamin B) to further enhance the effectiveness of this miraculous ointment. It's anti-bacterial, anti-viral and anti-fungal. 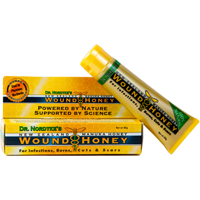 Apply it to any wound, sore, burn, rash or scrape -- even diabetic ulcers -- to speed healing. Used by vascular surgeons, general surgeons and podiatrists to promote sound healing, it is a must for your medicine cabinet. Do not use if sensitive to bee products. Not for use on children under two. Unretouched before and after photos shown at left of a severe burn treated for just six days with Wound Honey. Product Contains:New Zealand Active Manuka Honey (Active level: 12 plus), Aloe Vera, Panthenol. Sterilized.